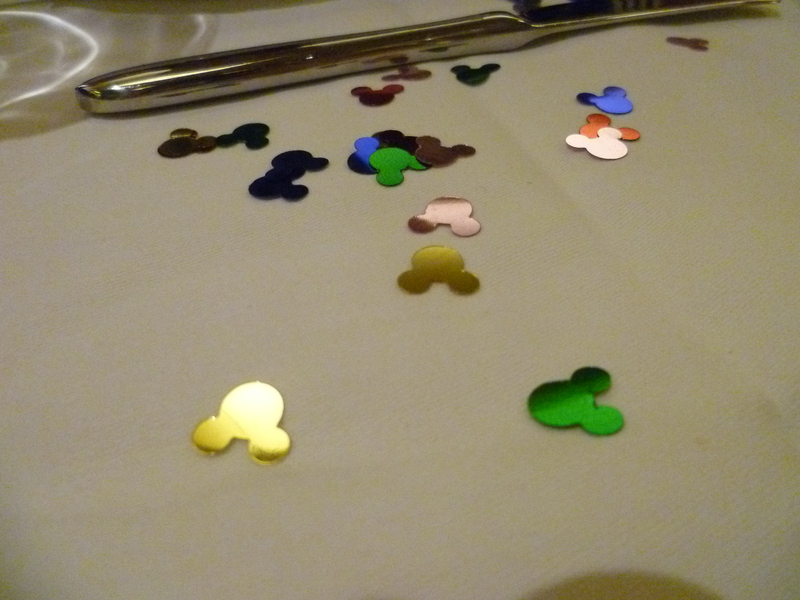 As mentioned last year, I’m just not a fan of New Years Eve. It annoys me. 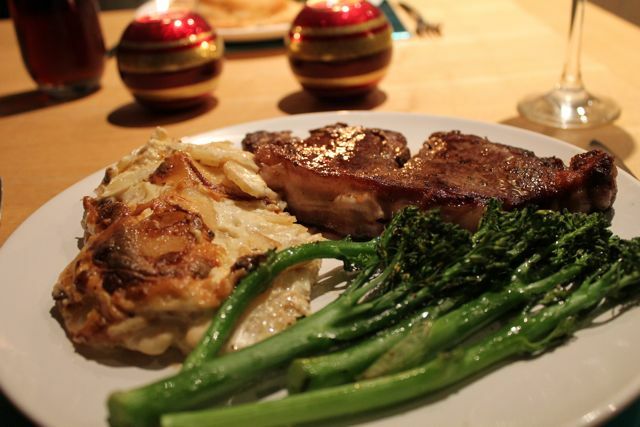 Christmas, however…now you’re talking! I love every little thing about the festive season and it always begins, for me, November 1st, not a moment later. It would begin slightly earlier but alas, Halloween is also a very big part of my life and I just can’t encroach on those fun, spooky and ghoul-filled happenings. Ahhhh, Christmas. Decorations, fairy lights, Christmas music that I start listening to in November and get sick of by November the 12th but continue to blare out in my car nonetheless, lie-ins, family time, the Christmas Radio Times, TV specials, parties, special sparkly outfits, cinnamon candles, bucks fizz, red nail polish, gift-wrapping, the smells of mince pies baking in the oven, The Snowman, and most importantly, the endless amounts of delicious party food, cheeseboards, crisps and general nibbly bits that are happily available at every house you visit for two glorious weeks. Christmas Eve was always my favourite day as a child, I preferred it to Christmas Day! Something about the dizzying levels of anticipation that built up throughout the day until I felt I would burst just made it the best day for me. We had a lovely Christmas this year. Myself and Ben were lucky enough to have a good two weeks off together and then I had a few more days on my own once he went back to work. I felt seriously relaxed by the end of the break and happy that we’d seen so many of our friends and family. I was spoilt rotten this year with prezzies and we also both got so many lovely presents for our flat from our thoughtful families 🙂 I’m sure many of the kitchen gadgets will be appearing on the blog over the next few months! So, what was on the menu? Obviously, I wanted to cook something special, something we don’t have very often. For me, this is steak. 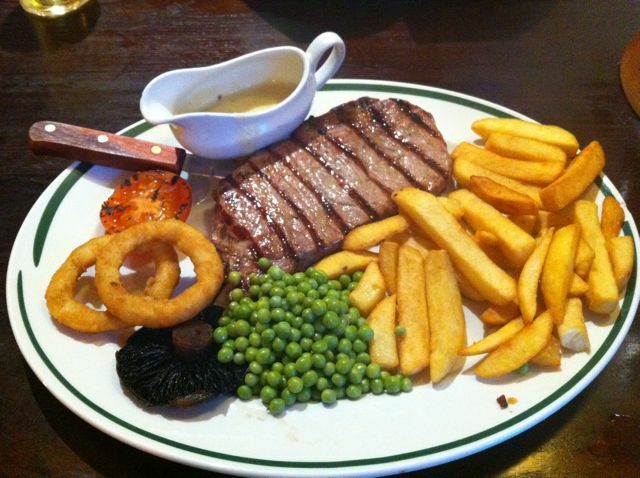 I only ever have steak if we go out to eat and it is a bit of a treat for me. 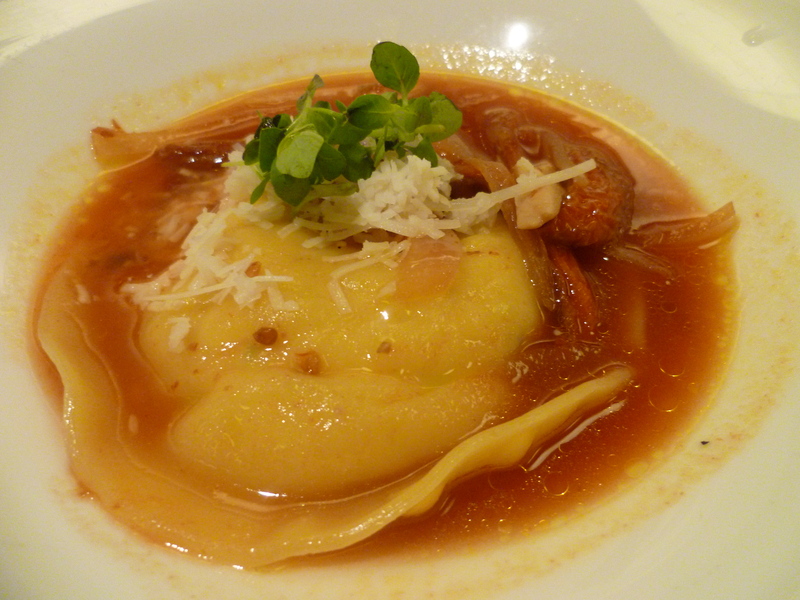 We also decided on potato dauphinoise, our absolute favourite side-dish in the history of side-dishes. 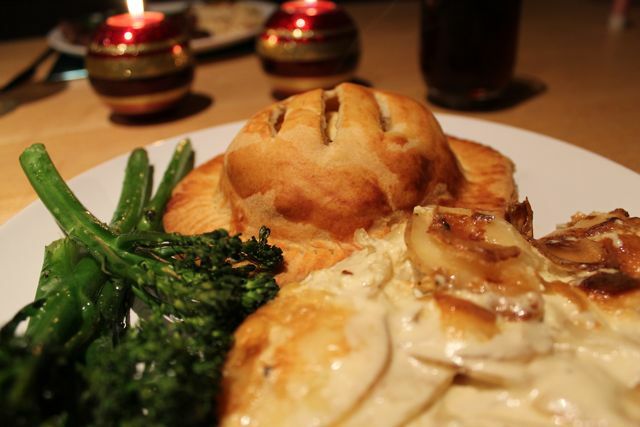 Ben asked for mushroom wellington and we added tenderstem broccoli to finish off our main course. I really wanted scallops for my starter and I had the genius idea to use Linda McCartney fish-free prawns in Ben’s starter, so we could have the same thing! We opted to use a chocolate fondue kit that we’d received for Christmas as our dessert, although we silently resigned ourselves to the fact that we almost definitely wouldn’t be able to manage it, we never can! 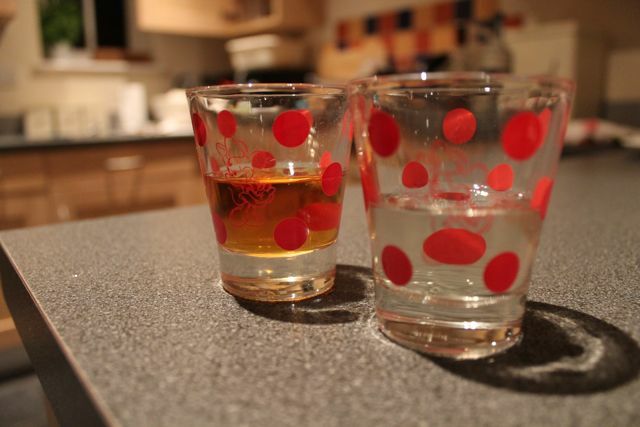 No New Years Eve would be complete without a shot! And carrying on with the Disney theme, Ben used our beautiful Mickey bottle opener to crack open some cider as we began cooking. 3. Started to then boil the sliced potatoes in the hot cream mixture to start them off but got impatient at the tiny amounts of potato we could boil at any one time due to the size of our saucepan, gave up and just chucked the potatoes back into the dish. 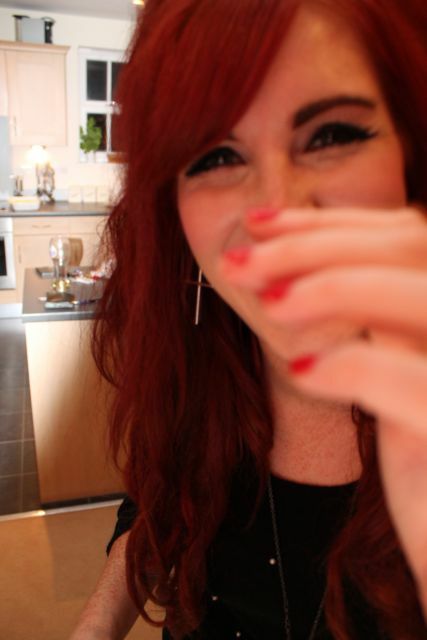 So technically, 1/5 of the potatoes had been boiled for a bit in cream but the rest went in the oven raw. I also HEAVILY seasoned each layer of potato, mixed them around a bit with a wooden spoon and then heavily seasoned again. We do not like bland dauph! I then cooked them extremely low, like 120, for 2 hours. One hour covered in foil, one without. While they were cooking, we cracked on with the rest of the dinner! I made Ben’s mushroom wellington first of all. 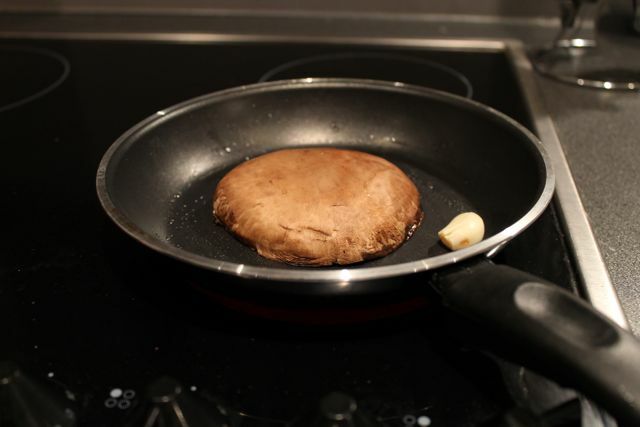 I panfried a washed, dried portobello mushroom with a garlic clove just to give it some flavour. 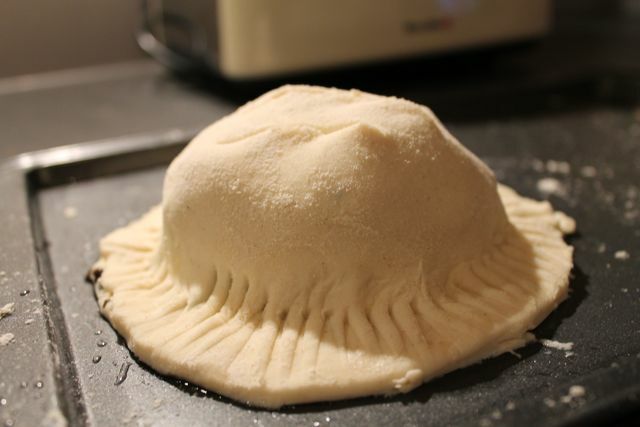 I then laid the portobello mushroom on a square of ready-made puff pastry and this formed the base of the wellington. I topped it with a mixture of spinach, chopped onions and chopped mushrooms which was all sauteed together for about 20 minutes with garlic and lots of salt and pepper. Finally, I added a big spoonful of cream cheese to the top of the mushroom mixture and covered the whole thing with another square of puff pastry. 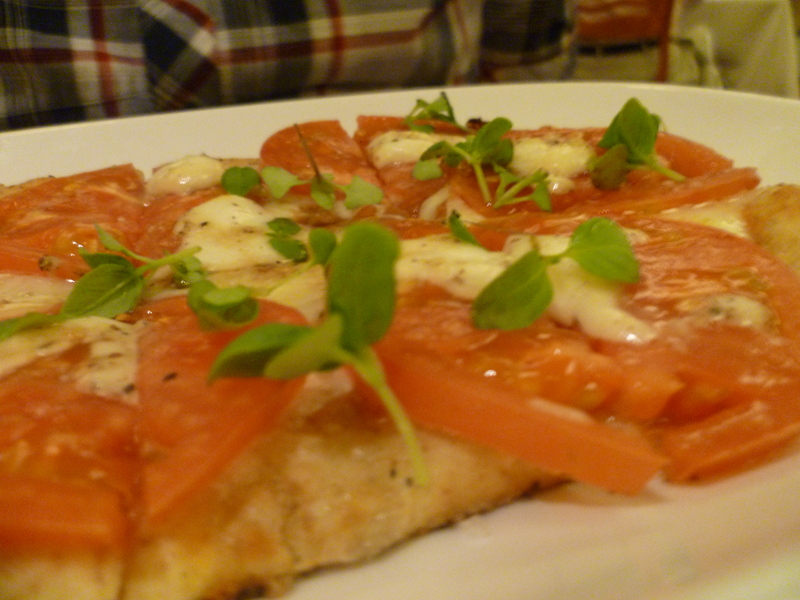 It was very easy to make and I hoped that the addition of cream cheese would elevate it to something quite special. Ben loves mushrooms and he REALLY loves pastry, so he was pretty psyched. Next up were our starters. 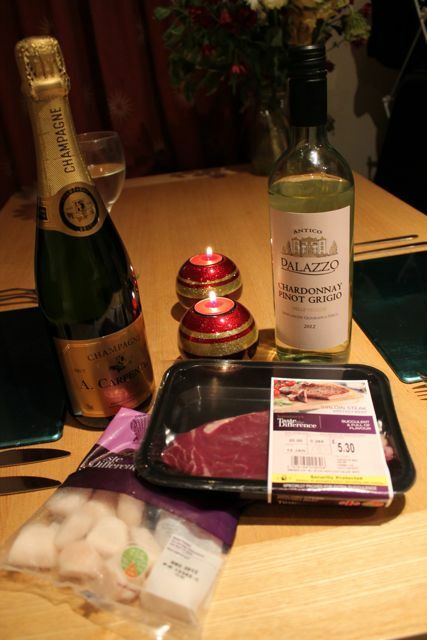 Scallops in a garlic butter gratin for me, prawn-free prawns in a garlic butter for Benj! 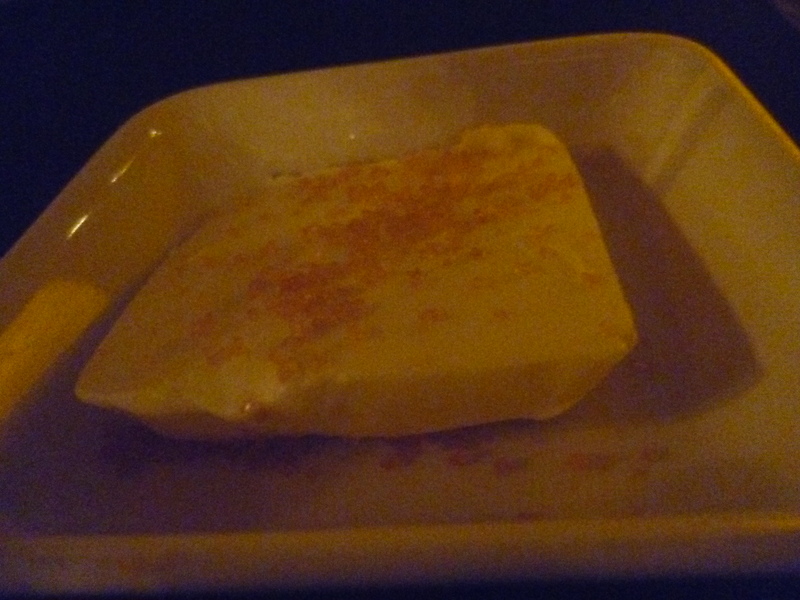 I mixed together butter, lots of crushed garlic, parsley and chilli flakes. 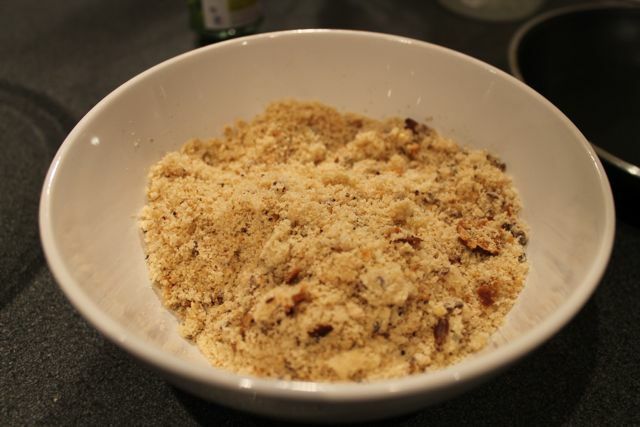 I mixed the breadcrumbs in with the butter and saved a bit to top the ramekin dishes before we baked them. 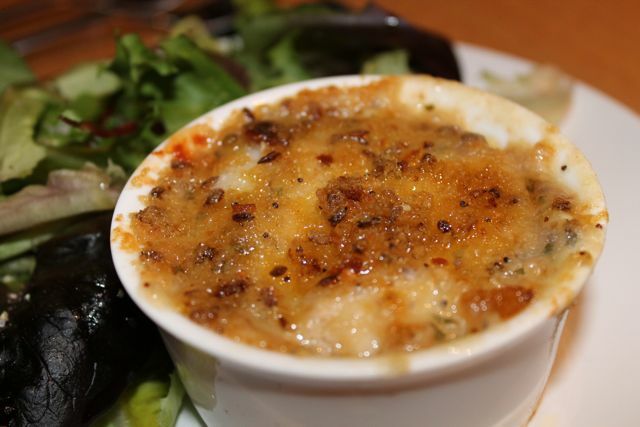 I then layered flash-fried scallops in one ramekin and the veggie prawns in another, dotted the butter mixture around them and the starters were done! Super easy. With most of our prep work done, we settled down to play the Big Fat Quiz Of The Year via 4OD, pens and paper in hand. At about 9.30 after the Quiz finished (neither of us can remember who won…but I do know I did better than I have ever done!!) we wandered back into the kitchen to start final proceedings on dinner. We roasted the broccoli and I cooked my steak, on a frying pan, 2.5 minutes on each side for medium rare. It was perfect! I used St Agur for my blue cheese sauce and at 10pm we were ready to eat. We’d eaten late on purpose as I often get really tired after a big meal and just want to sleep so if we’d have eaten at 6 I wouldn’t have seen midnight!! 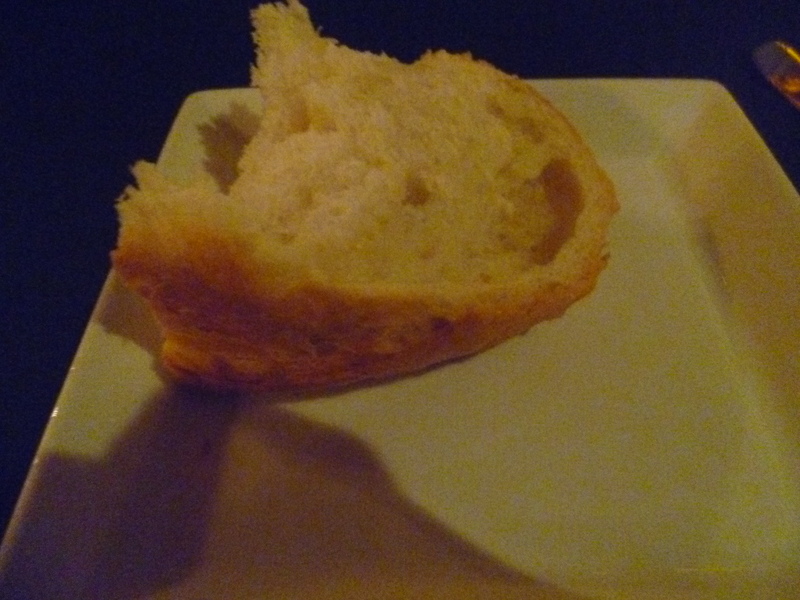 The starter was, quite frankly, phenomenal. 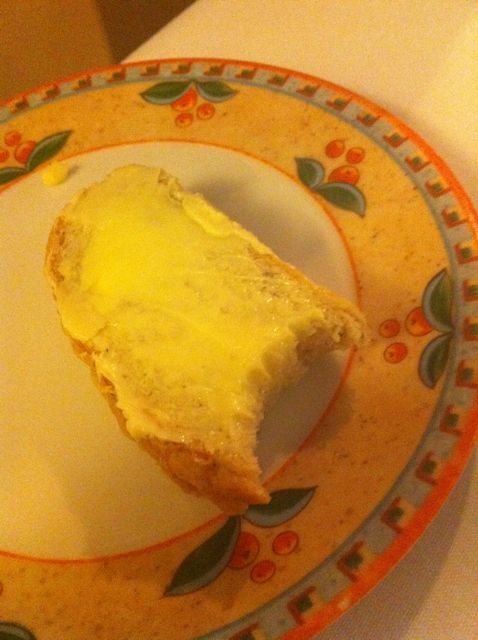 That much butter in a single starter should possibly be illegal but oh my god, was it amazing. The scallops had almost been poached in the butter and as a result were silky and soft. 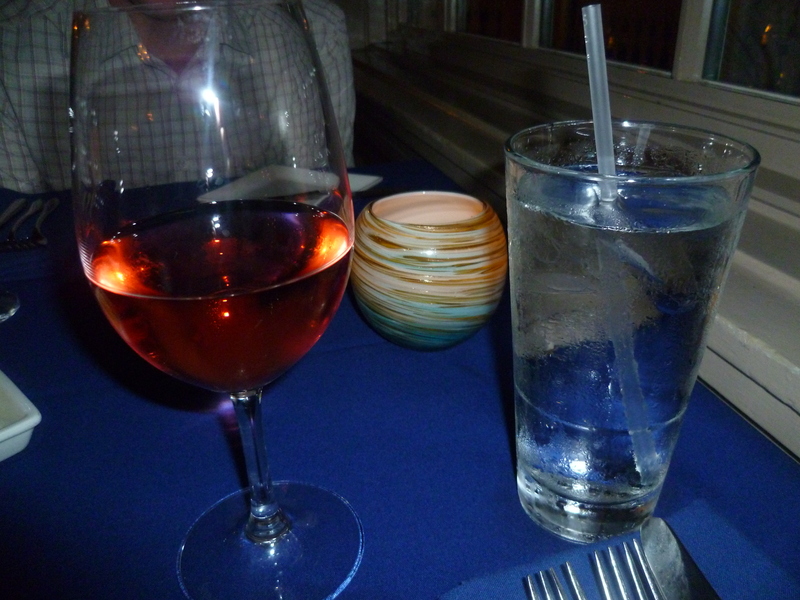 I also loved the fact that we were both eating nearly the same thing – that almost never happens! 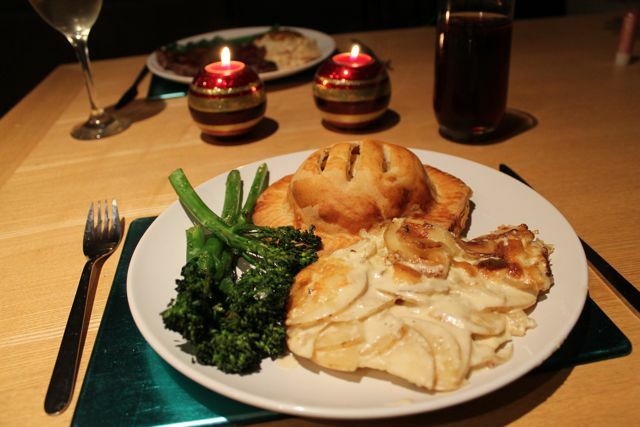 Then, the main event…mushroom wellington, dauphinoise potatoes and tenderstem broccoli for Benjamin. 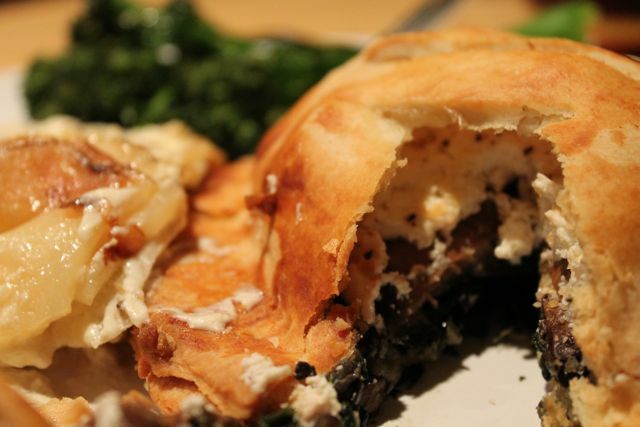 The pastry was flaky and buttery, the mushroom firm and garlicy and the mushroom mixture and cream cheese helped keep it all moist and flavourful on the inside. I was ridiculously pleased with how this turned out and I’ll be whipping this bad boy out if we ever have a posh dinner party as I think it really looks the part! And, my steak. Sainsburys Taste the Difference sirloin, medium rare. With only salt and pepper as seasonings, the flavour of the beef shone through. 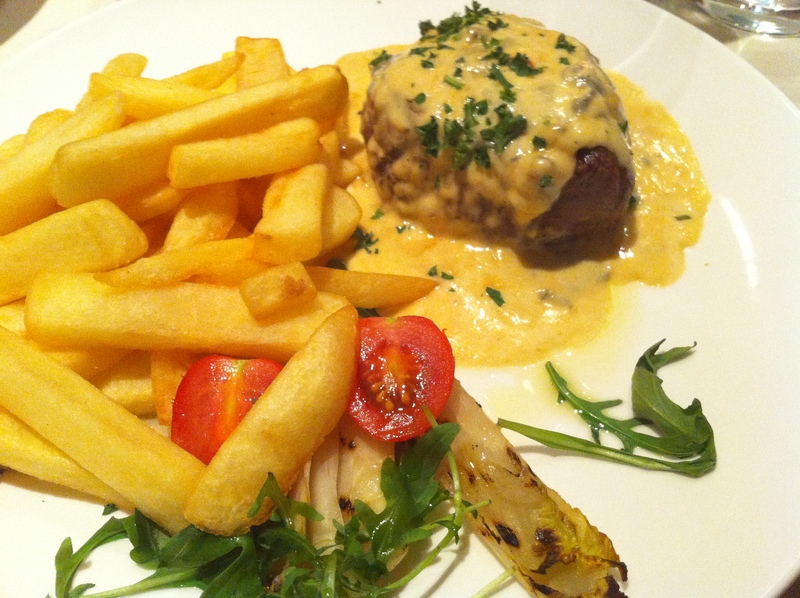 I’ve waxed lyrical about my love affair with steak and blue cheese sauce but the combination really is divine! And the dauph? The best yet!! Cooking the potato soooo slooowwlllyyy meant we were rewarded for our patience with rich, soft, creamy potatoes and a silky smooth sauce that did not curdle, I repeat, DID NOT CURDLE! It was a miracle. And they were also lovely the following day! Perfectly cooked. I can’t remember which chef told me 2.5 minutes on each side for medium rare, I think it may have been Mr Ramsey, but it is the best advice. A searing hot pan too! Things got a little smokey but we are blessed with an extractor fan, a window and a large kitchen so it really wasn’t an issue. As predicted, we were way too full for dessert, I could barely manage to drag myself out of my chair and move the 3 foot to the sofa. We finished eating and clearing away at about 11.15, so there was just enough time to write out our resolutions for the coming year, reflect on the highs and lows of 2012 and grab a glass of bubbly before the countdown started. We welcomed in the New Year in our beautiful new flat, congratulating ourselves on a fantastic end to 2012 and cheer’sing to 2013. I feel so lucky to finally be living with my boy after nearly 9 years as a couple and every day I wake up and can’t believe we’re actually in here. I’m also thrilled to have such an incredible new job that has already exceeded my expectations by sending me to Bali for a week last November (still can’t believe that!!). 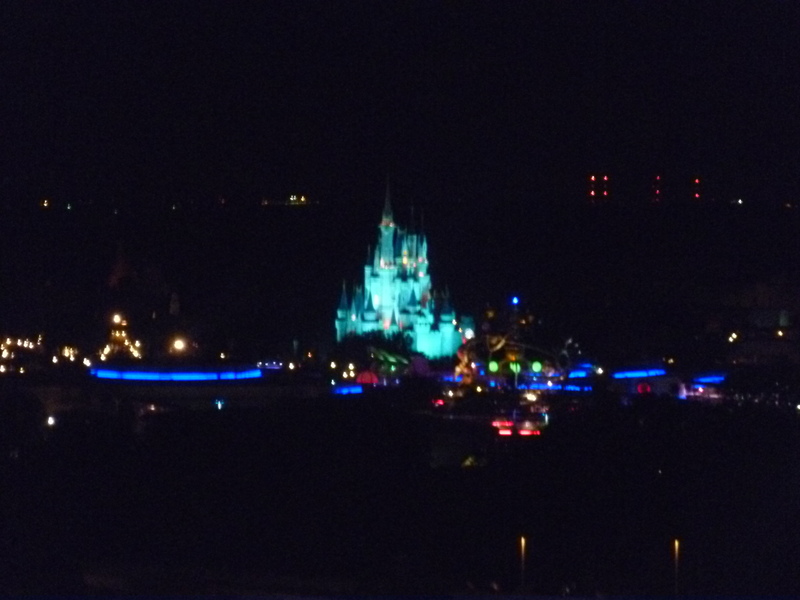 I’m looking forward to a lot of things in 2013; first and foremost our 3 week trip to Florida in October which I just know is going to be spectacular. It’s the Happiest Place On Earth!! I’ve already started the planning spreadsheet so I’ll be spending a lot of my 2013 evenings tucked up on the sofa, Orlando guidebooks surrounding me and The Dibb on my laptop. I can’t even wait!! I’m also excited about the possibility that we may be getting a furry friend to join us in our new flat this year…I’ve wanted a kitten for so long and we are lucky enough to have found a flat that allows pets (SCORE!!) so we’ll be doing lots of research and I’ll be trying to persuade Benj that these beautiful babies make the perfect pets 😉 We’ll probably wait til after Florida though as I wouldn’t want t0 leave her all on her lonesome for so long! 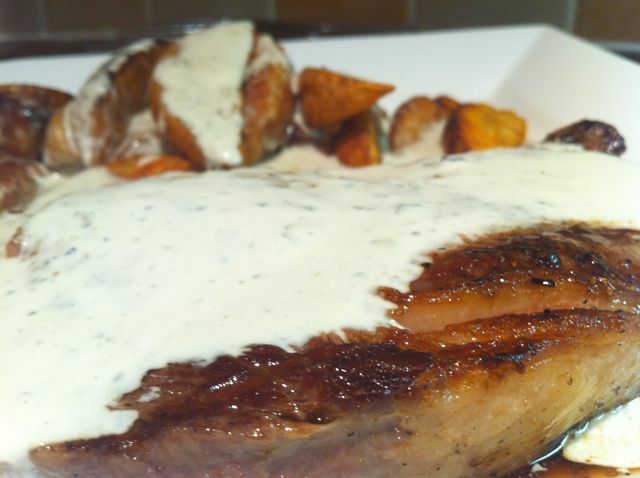 I’ve got a serious, chronic, all-encompassing addiction to steak, with blue cheese sauce. 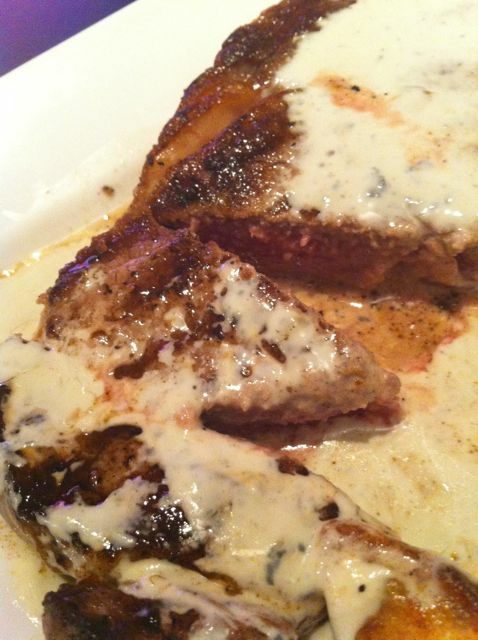 Steak without blue cheese sauce, is, at this moment in time, unfathomable. It has to have blue cheese sauce. It’s got to the point now where not only am I ordering it every time I see it on the menu, but I am also only choosing to eat at places if they have it on the menu. Not ideal when I share my meals on my food blog, as they are all starting to look verryyyyy similar. I’m not sure how long this addiction will last but it’s been about a year now and my need for SWBCS (see what I did there?) is still relentless. I’ve pretty much just embraced it and accepted that the moment will pass, in time. I never used to like blue cheese. Ironically, I often find that I don’t actually like the cheese itself, on it’s own. I much prefer it in sauce form. Sometimes I find it too strong and overpowering – obviously when combined with cream it becomes milder and much less ‘blue.’ This was confirmed in a sandwich I bought in America last year – the ‘beef and bleu’ sub from the Artists Palette quick service restaurant at Saratoga Springs Resort in Disneyworld. I took one bite and tragically had to throw it away because the cheese was strong and almost bitter, overpowering everything else in the sandwich. Yuck! Guess I’m not as big a blue cheese fan as I thought. 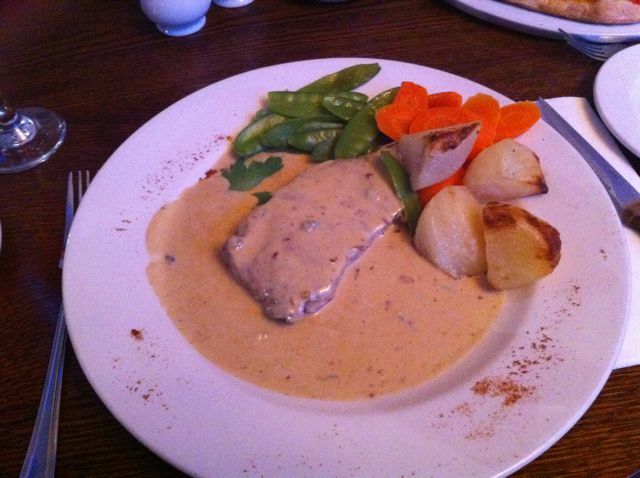 The first time I had steak with blue cheese sauce was at The Barleycorn Inn, in Bishops Waltham. 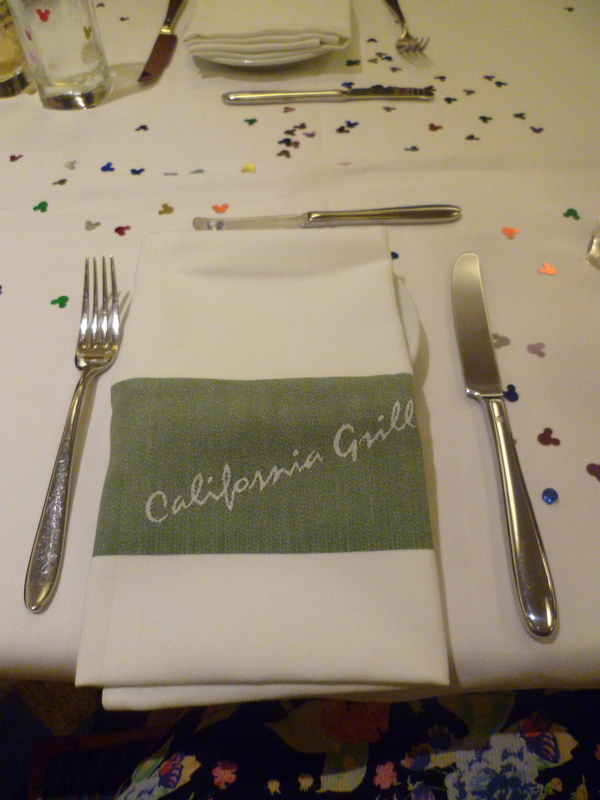 They used to have an ever-changing menu of exciting dishes and the steaks in particular always featured different toppings and sauces. I didn’t fancy anything else off the menu that evening so took a gamble on the ‘bacon wrapped, blue cheese topped’ variety, figuring I could always scrape the blue cheese off if it was a disaster. I was pretty excited for the bacon wrapped concept though, how often do you get the chance to eat bacon wrapped steak!? 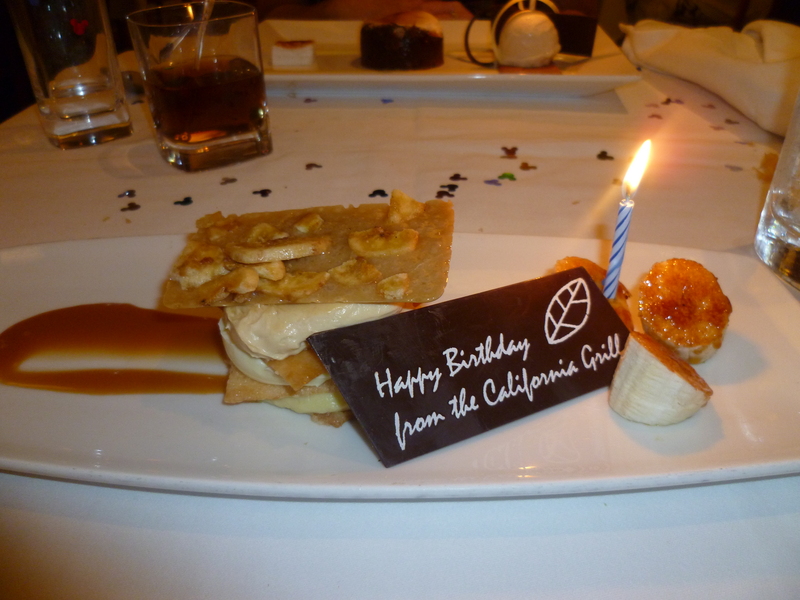 When it arrived and I started eating, I was blown away. 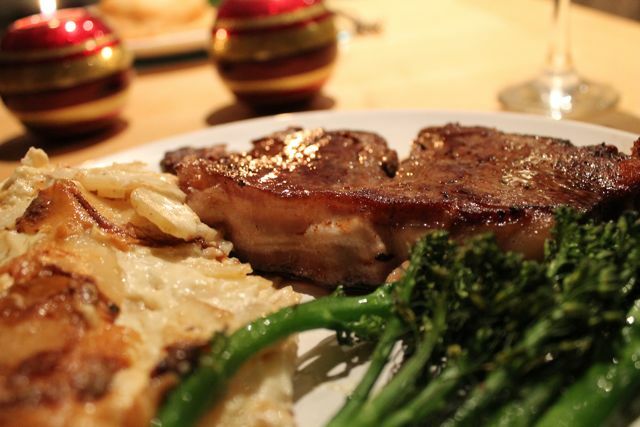 The steak was wrapped in a generous portion of thickly sliced back bacon, seared to perfection while keeping the steak inside juicy and tender. Slabs of blue cheese were nestled underneath the bacon, infusing the steak with melted, cheesy goodness. 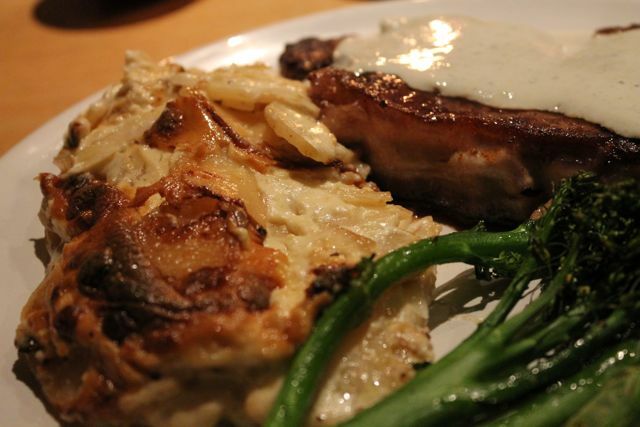 The whole dish was also topped with a creamy, mild blue cheese sauce. It was ALMOST a blue cheese overdose but I was so enamoured with the flavours that I ate the whole thing, squealing with joy at every bite. Everytime we went back to the Barleycorn I hoped to order that dish again but unfortunately, their ever-changing menu meant I never got the bacon-wrapped version again, only the blue cheese sauce topped. Still delicious, but not the same! 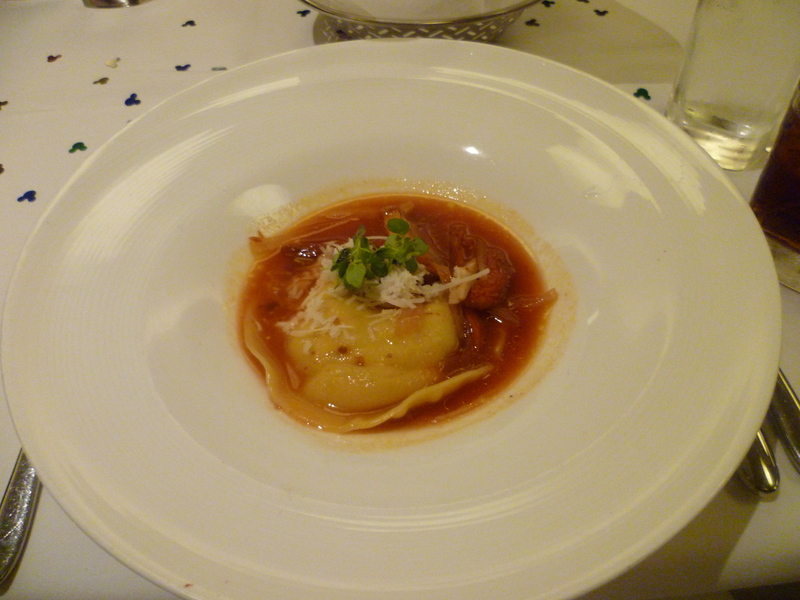 Although that does make my memory of that one meal extra special, in a nostalgic, reminiscing kind of way. Since that first experience, I’ve ordered SWBCS a LOT. Here are some of the S’sWBCS I’ve enjoyed 🙂 There are more not pictured! Slack photo taking but this was from The Ship Inn, Weymouth! Last but not least, SWBCS cooked by my own wonderful father! He knows how keen I am on the combo so fired up the BBQ one night last month when the weather was nice and surprised me with my favourite meal. What a treat! 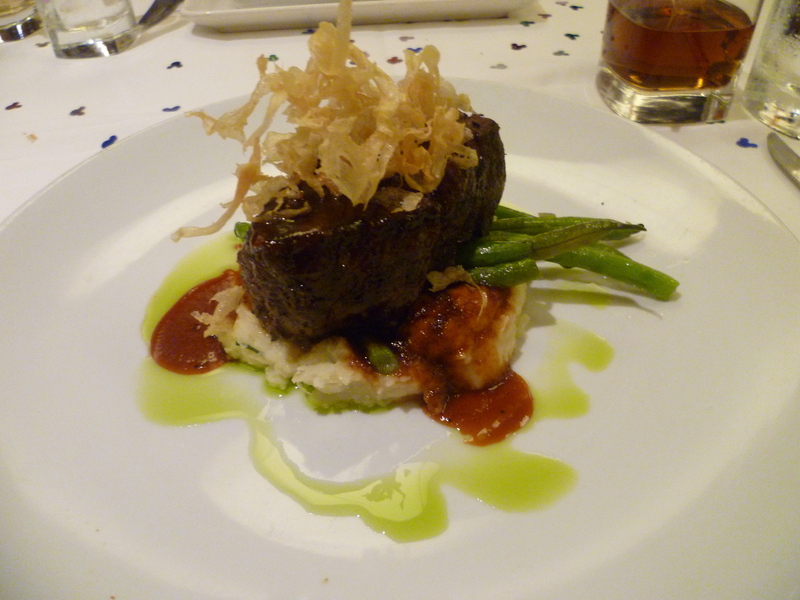 It tasted amazing and I had deep discussions with him about how to achieve a restaurant quality steak, at home. I was starting to realise how expensive my addiction was becoming and while I believe in treating oneself once in a while, going out especially for one dish was becoming a bit excessive! The average cost of a SWBCS, in my experience, is £16/17. Oops! He cooked our steaks on the BBQ so the heat was high enough to sear the outside while keeping the meat tender and juicy. 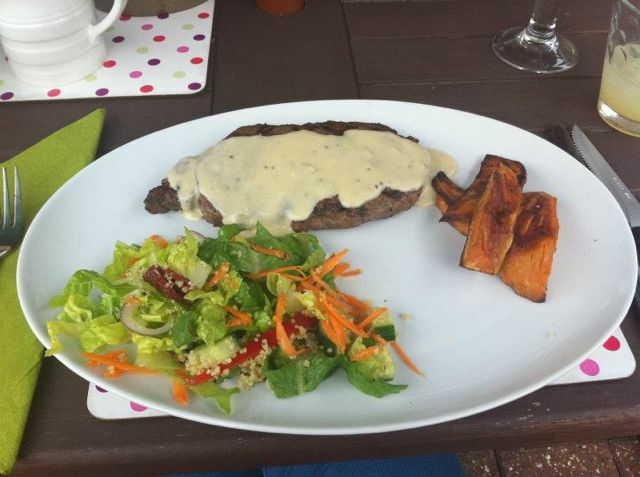 Perfectly medium rare, just how I like them, with delicious sweet potato wedges on the side. Pretty much my ideal summer meal! While I was Googling, a hit appeared for possibly my favourite food item on earth, Creme de St Agur, explaining that a simple blue cheese sauce could be made just by heating the dip up! GENIUS! I can’t believe we’ve never done this before, we always just serve it cold with crisps and nibbles. It was like a whole other world of warm, cheese based snacks was suddenly introduced to me. Decision made, I dumped the dolcelette and grabbed a tub of my good friend Mr Agur. Back home, preparations began for the steak. We were actually staying in my brothers flat for the weekend to look after his kitten and I was slightly concerned at the lack of ventilation as I knew things were going to get smoookkkeeeyyy! We placed the kitten in the bedroom for the few moments the steak was cooking so that we could crack the window right open. I heated up a grill pan to the very highest it would go and watched it smoke, trying to ignore the fact this goes against everything I’ve ever been told about cooking. The steak went on the pan with an almighty sizzle and I let it cook for 2.5 minutes before flipping it over. 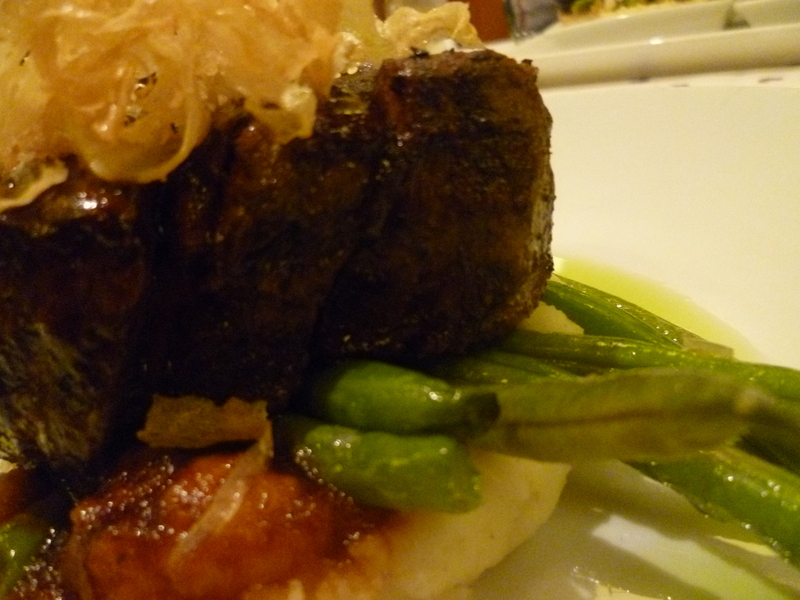 It had impressive sear marks which I was pleased with and it was smelling great. 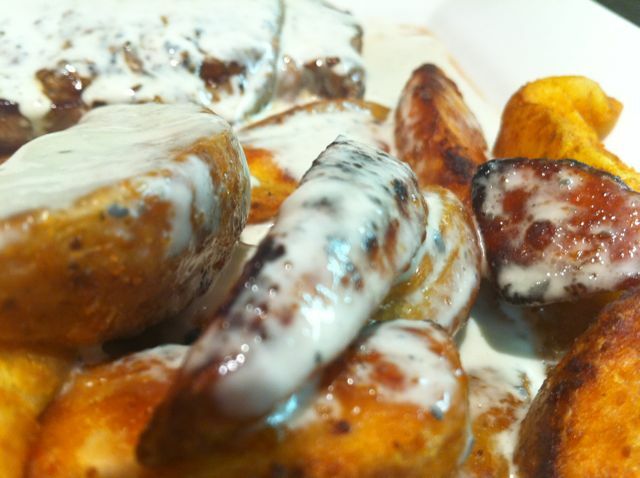 I heated up the St Agur in a pan and served my potato wedges onto the plate. 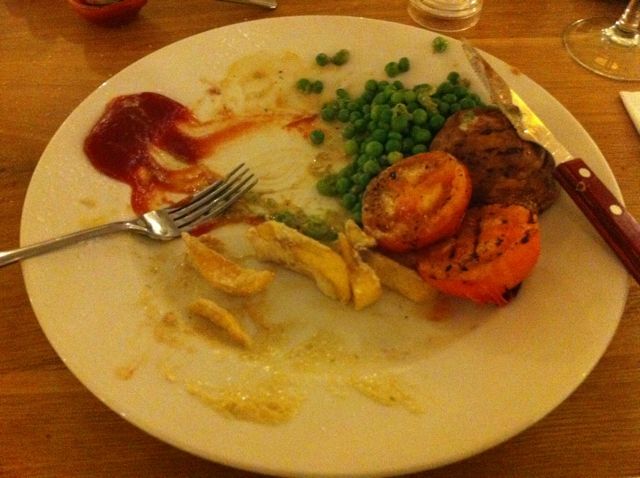 Once another 2.5 minutes had gone by I bit the bullet and placed it on the plate. I’d rather have it slightly too rare than overcooked and I knew it’d keep cooking once it was on the plate. I spooned a very generous amount of Creme de St Agur over it and left it to rest for a couple of minutes while we let the smoke disappear. It actually didn’t get as smokey as I’d been led to believe through reading online, so that was great. I still wouldn’t recommend doing this in a tiny enclosed kitchen though and it would definately be easier on a BBQ. Once the smoke had all but gone I left the extractor fan on, closed the window and let the kitten back in. We were ready to eat! Obviously, Ben politely declined the steak and instead opted for wedges and Quorn meatballs, with BBQ sauce. A winning combination. 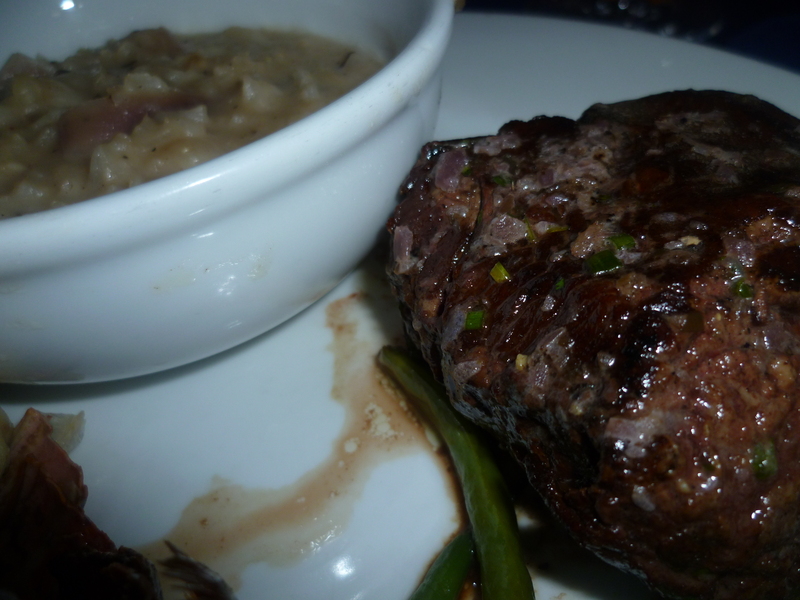 I was so excited and nervous to cut into my steak and see how it had fared during the cooking process. The result? An unprecedented success! 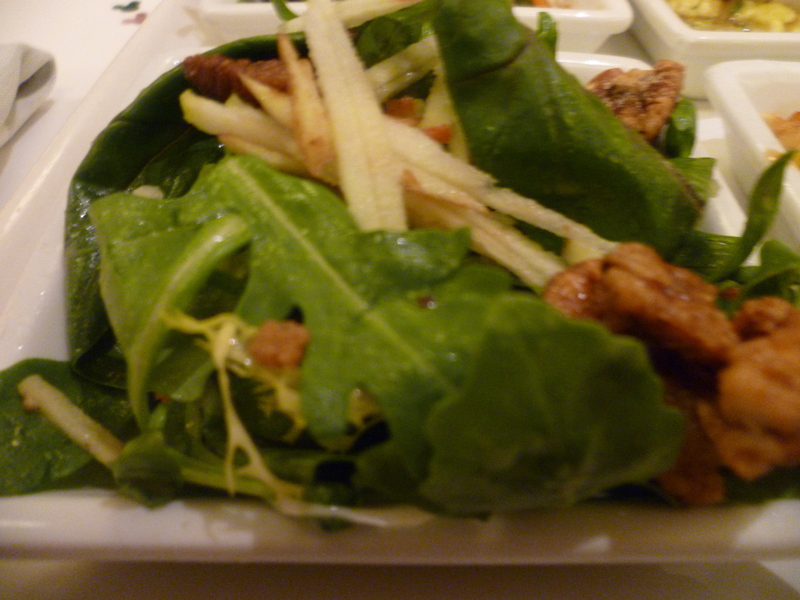 These photos are awful because I was so eager to eat that I didn’t really play about with angles or shots or anything…but you get the gist. 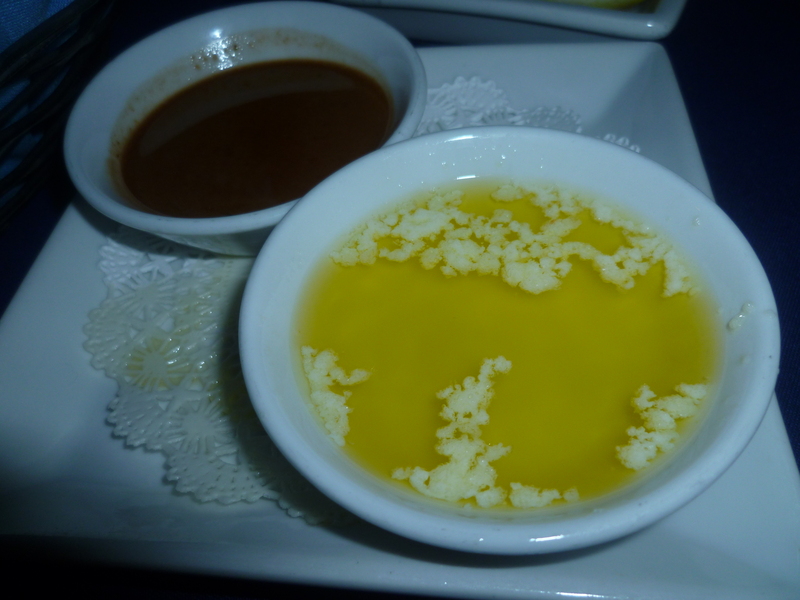 The sauce was INCREDIBLE but the blinding white colour was ever so slightly off-putting – I think I’d prefer a pale, creamy yellow if I was being really picky. 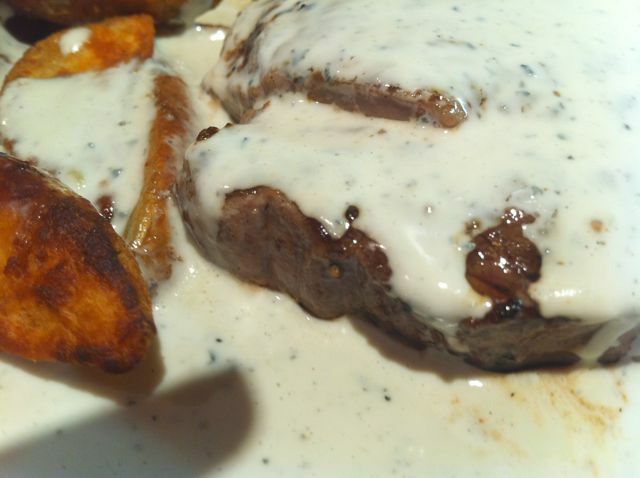 The flavour was spot on though, the best blue cheese sauce I’ve ever had I think. Probably because it was just melted cheese and cream. Or liquid fat, if you will. 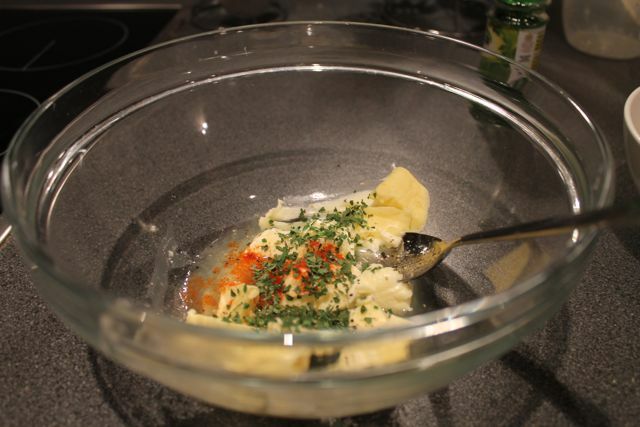 Using Creme de St Agur is an excellent lazy-boy option for blue cheese sauce and I really recommend it. 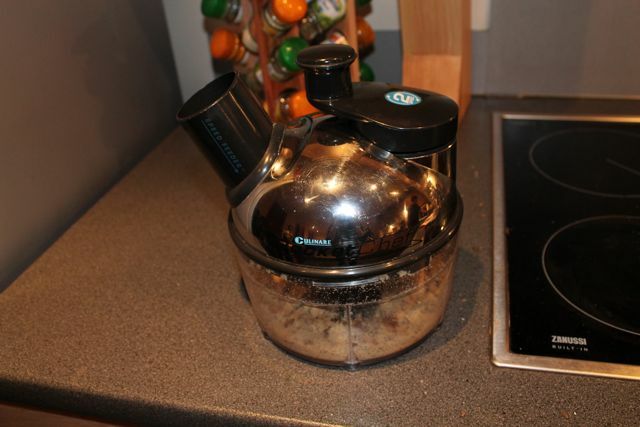 The website advises using a microwave but I heated it gently in a saucepan and it was perfect. I tried valiantly to show the colour of the inside and how tender the meat was but the urge to pick it up and shove it in my face was too strong. Trust me when I say, it was medium rare. Success! So, 2.5 minutes on each side of a 1.5/2 inch piece of meat really will produce a medium rare steak. 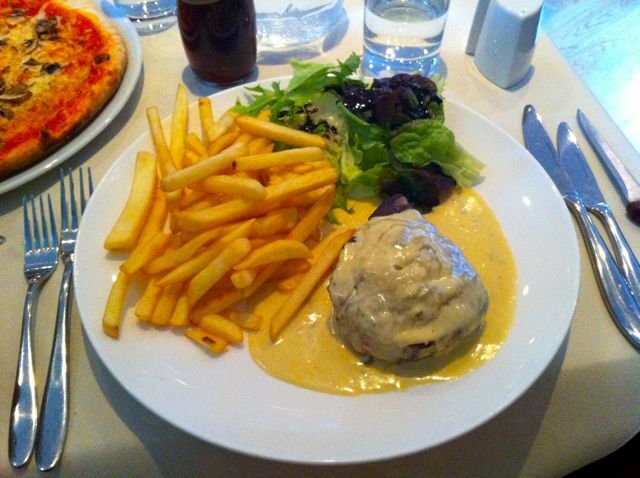 You can see in the below photograph how juicy and moist it was – the juices mingled with the sauce to create a really quite magnificent meeting of meat and dairy. 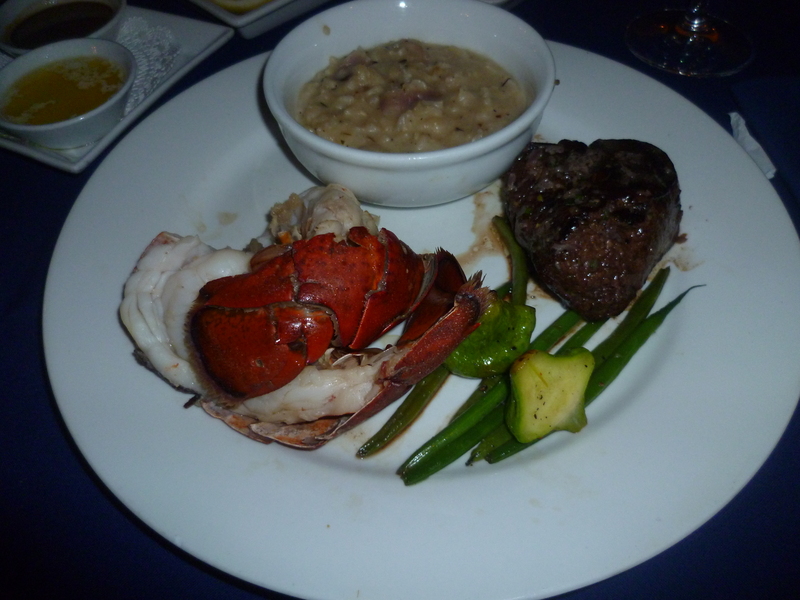 This meal was OUTSTANDING. I am thrilled that I can now recreate almost-restaurant quality steak at home and it really is very easy. Obviously I’ll still be ordering it when we go out to nice restaurants but perhaps I’ll be able to order something different if we go to a bog standard pub, as I now know I can make it at home just as well, if not better. 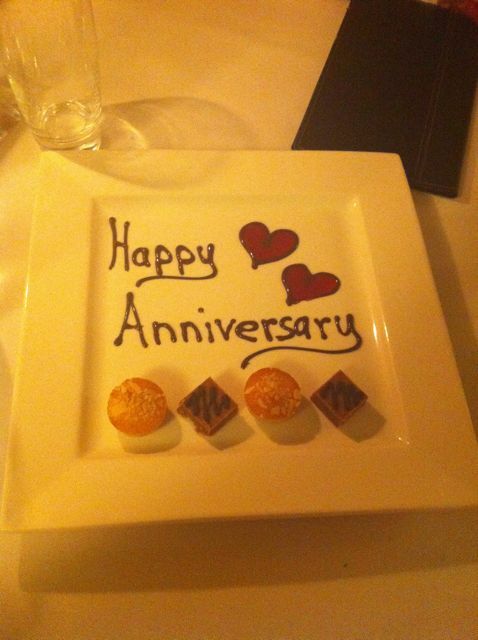 We just got back from a delightful weekend away to celebrate our anniversary. Eight years! Goodness me. We visited the English Riviera and stayed in the adorable town of Paignton; partly because we love a good seaside visit and partly because I got some bargain hotel prices during the Christmas Travelodge sale. £12 a room cannot be scoffed at. The hotel was more than adequate and after a slightly tense arrival where we discovered the carpark was full and we’d have to park my beautiful red Nissan Micra Marilyn a few roads away in a decidedly dodgy spot, we had a wonderful stay there. 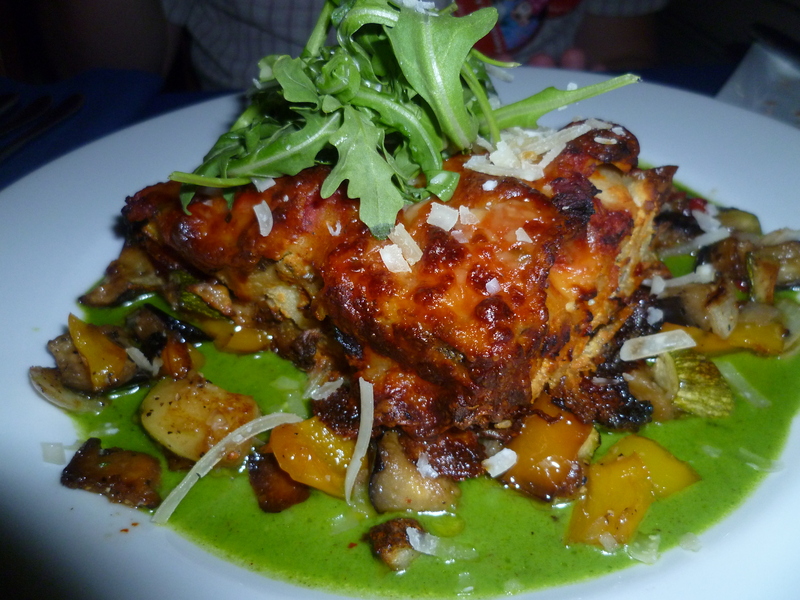 But obviously the most important part of this trip, as with all trips, was the food! 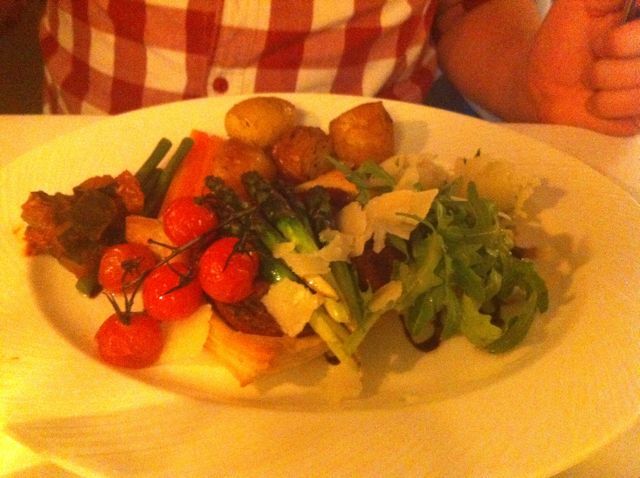 We ate at some lovely places and I’ll be sharing all the details in good time but I have to start with the highlight of the weekend – our meal at The Orange Tree restaurant in Torquay. I booked a table online a couple of weeks ago after being warned that it gets very busy on Friday and Saturday evenings. Our table was booked for 7.30pm and we arrived promptly after getting absolutely soaked from the rain beating down outside. We were greeted warmly, relieved of our coats and led inside the cosy eatery to a lovely table for two. 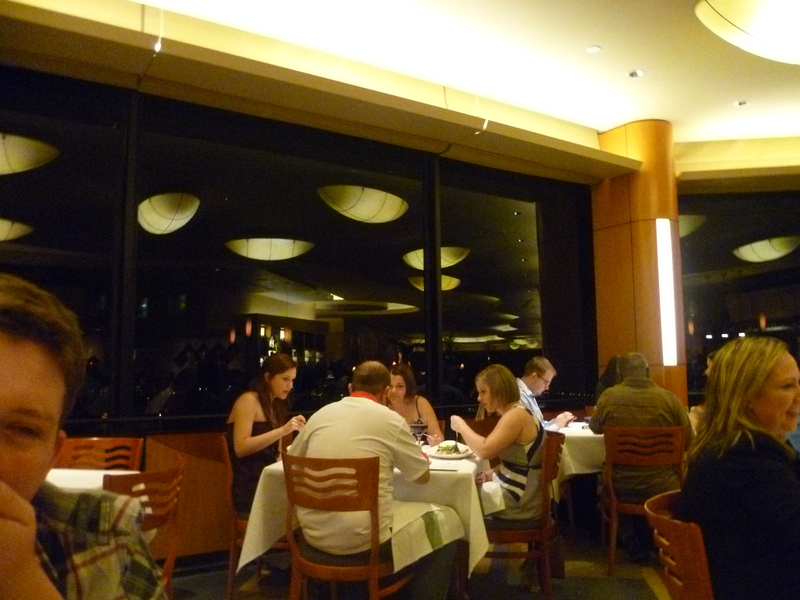 We noted that the tables were nicely spaced apart which we were very pleased about; nothing worse than feeling like you are essentially dining with the couple next to you! 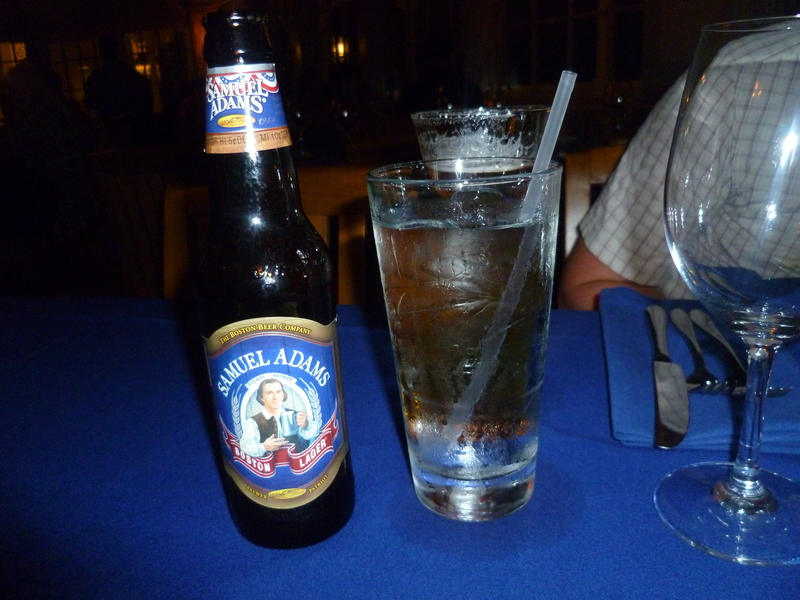 We ordered our drinks and perused the menu which was looking amazing. 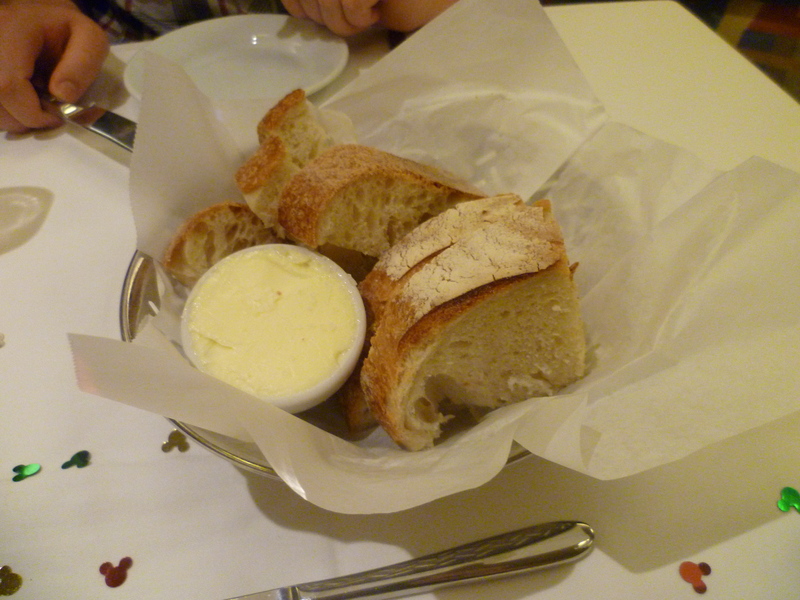 After ordering our starters we were bought out warm parmesan and olive bread with butter. This warranted a photo although I am apologising in advance for the photographs of this meal – the restaurant was very dark and intimate and I really didn’t want to blind our fellow diners with the flash. I promise my other photos from this trip are better! A bit better. After a pleasant wait, our starters were bought out. 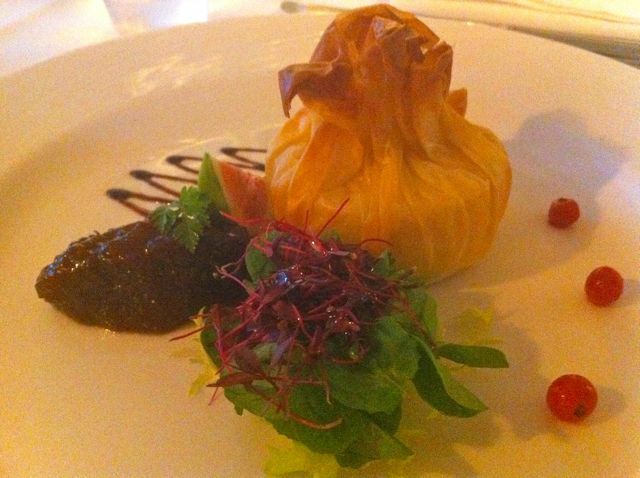 I chose the ‘Gevrik’ Goats Cheese with Red Currant and Fig Chutney – Cornish Goats Cheese Parcel baked in crisp Filo Pastry accompanied by Red Currant and Fig Chutney. Oh, it was pretty! 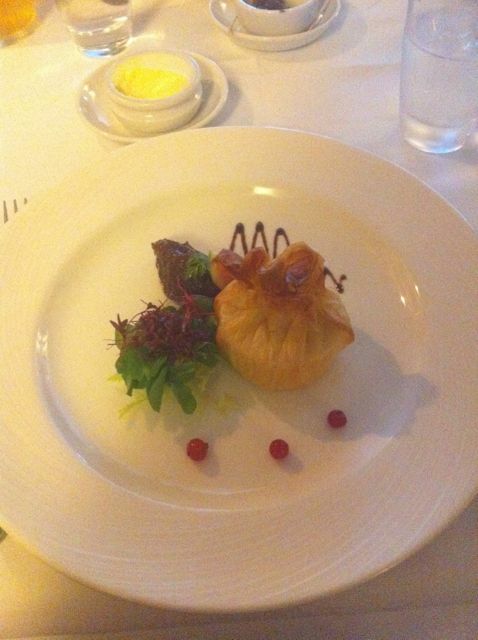 The goats cheese was incased in the crunchy, buttery filo pastry and it was perfectly melty and gooey inside. 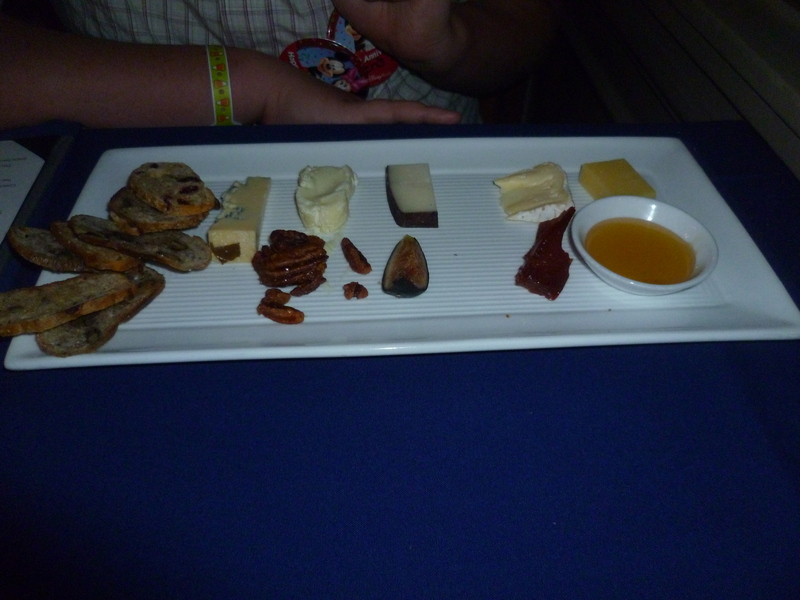 The chutney was sweet and fragrant and provided the perfect accompaniment to the cheese. Pretty much my perfect starter! 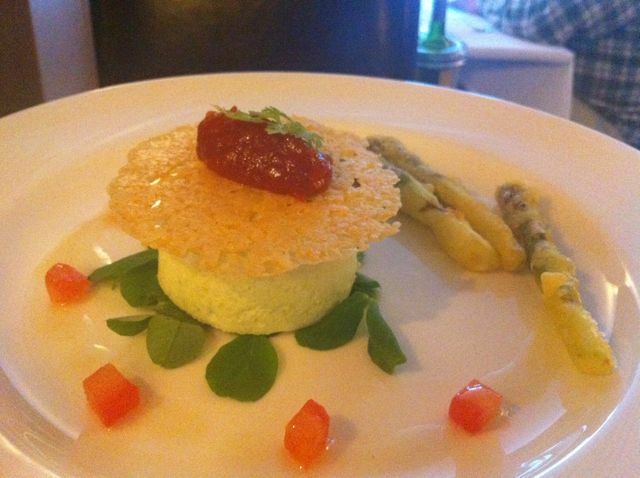 Ben chose the Tian of English Asparagus – Tian of Asparagus Mousse with Tomato Chutney and Parmesan Crisp, served with Tempura baked Asparagus Spears. 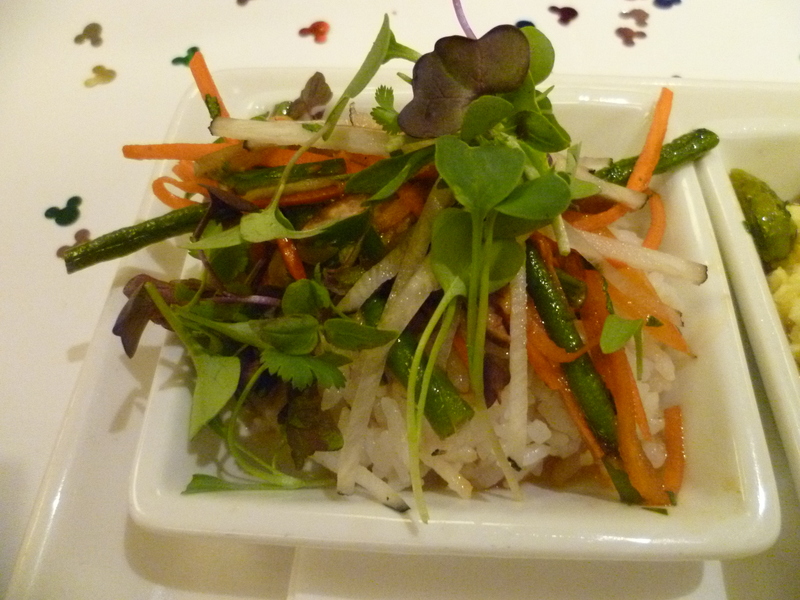 He was wary of ordering this as he’d spotted that the veggie main course was asparagus based and quite frankly he wasn’t sure if he wanted that much asparagus in his life. I thought he’d choose the goats cheese but as the waitress asked what he’d like he changed his mind and plumped for the asparagus. 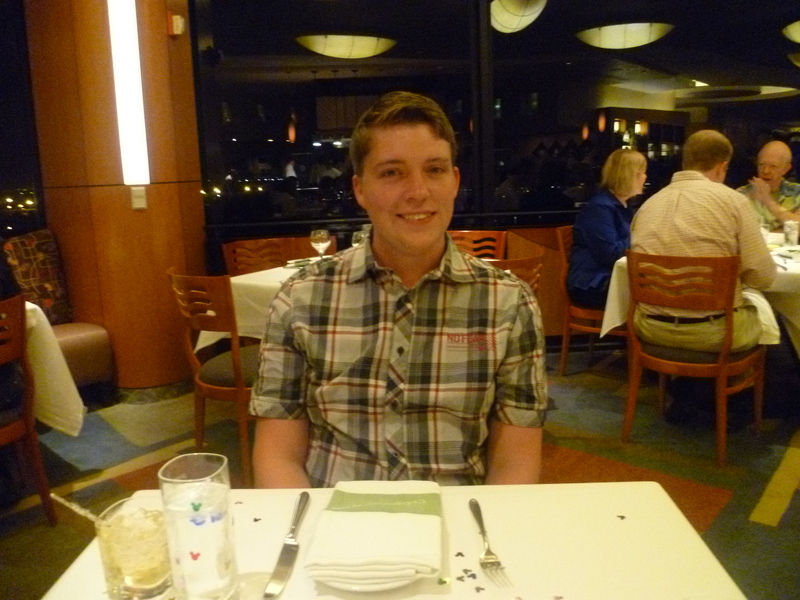 He was really pleased he did as his starter was delightful. 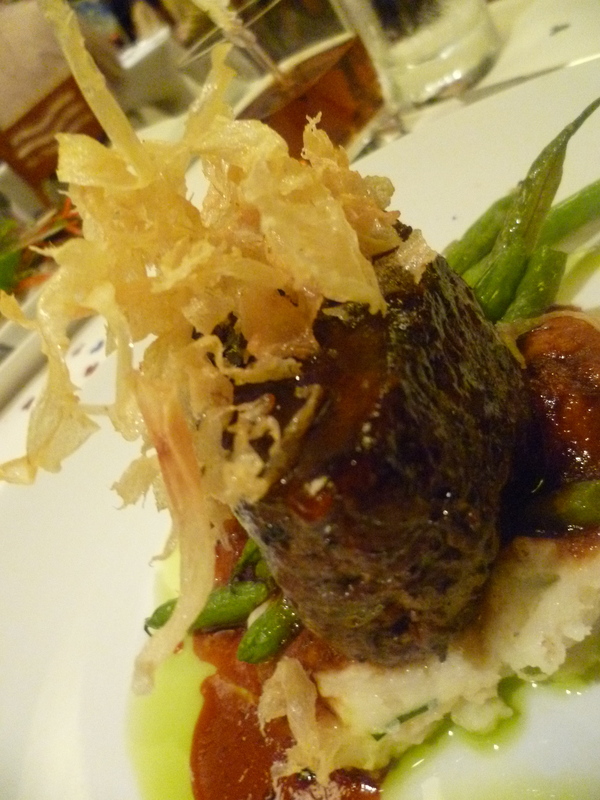 The mousse was creamy and fluffy with a delicate asparagus flavour and the tempura was light and crispy. 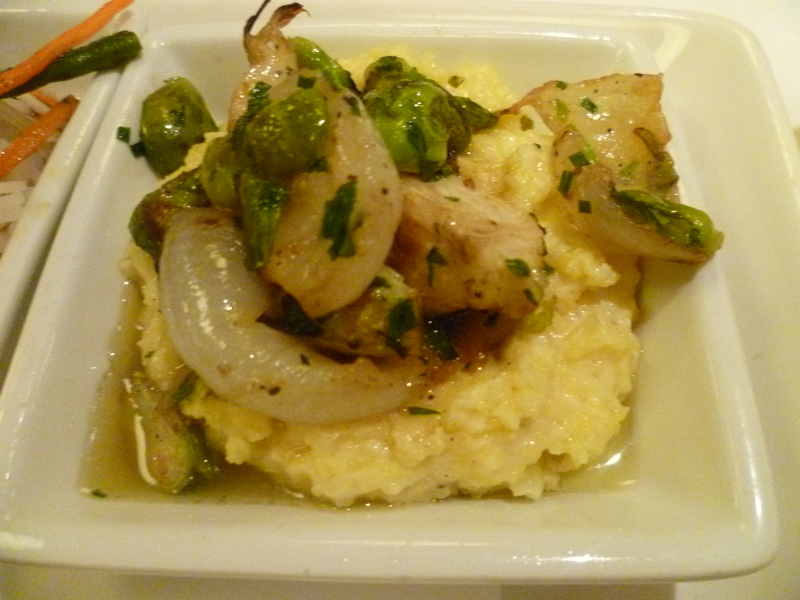 There was no denying this was a lot of asparagus but he really enjoyed all the different textures and flavours. 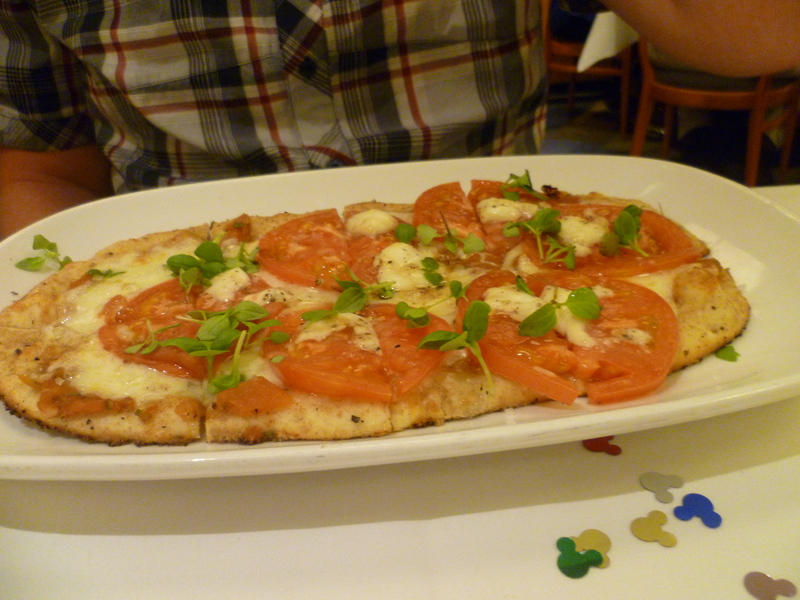 As the waitress told us, you have to make the most of them while they’re in season! The parmesan crisp was gone in a matter of seconds as anything cheese-based generally is on borrowed time when it’s around Ben, but I am assured it was divine. 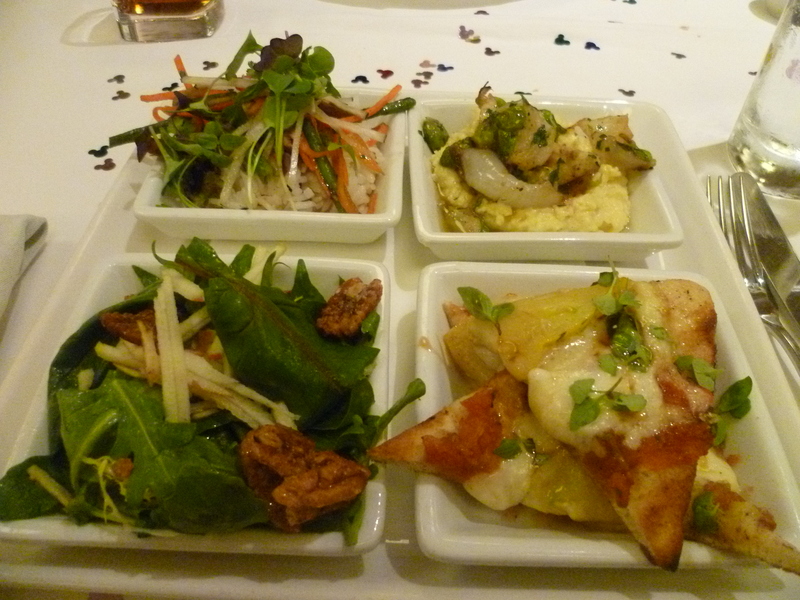 We had a nice 10/15 minute break between our starters and main courses which I have to say we really appreciated. You don’t often get this at restaurants but I love the opportunity to relax in between eating and savour the experience of actually being in the restaurant. 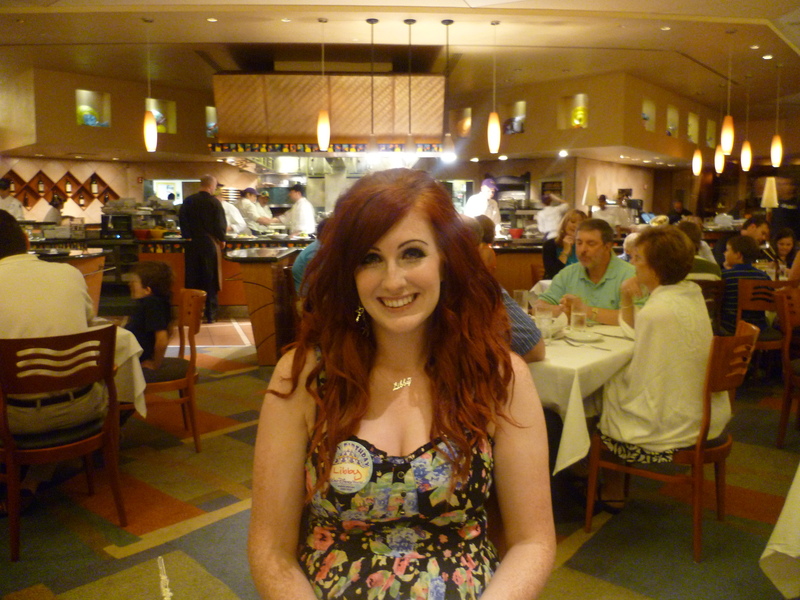 Our main courses were presented to us and I was instantly a very happy girl! These photographs really are getting better and better, don’t you just love the increasingly jaundice tint!? 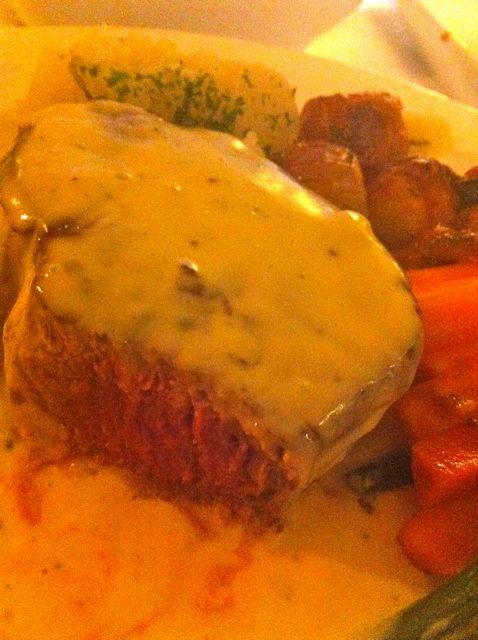 I, of course, ordered the Grilled Prime ‘South Devon’ Fillet Steak with a Devon Blue Cheese Sauce. I have mentioned numerous times (possibly too many?) 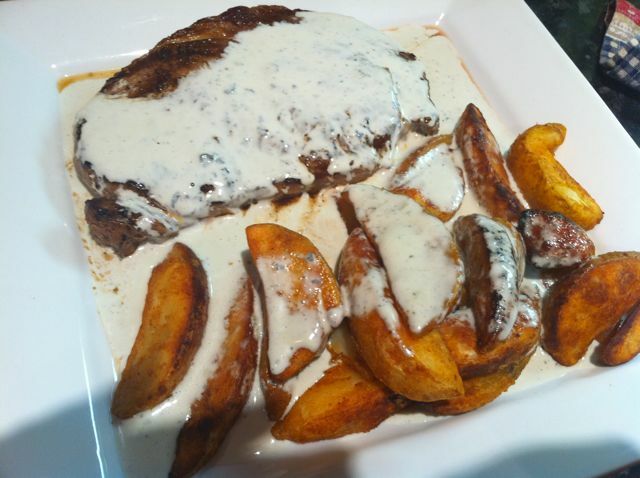 that steak and blue cheese sauce is my idea of heaven and I find myself going to restaurants specifically to have this dish. 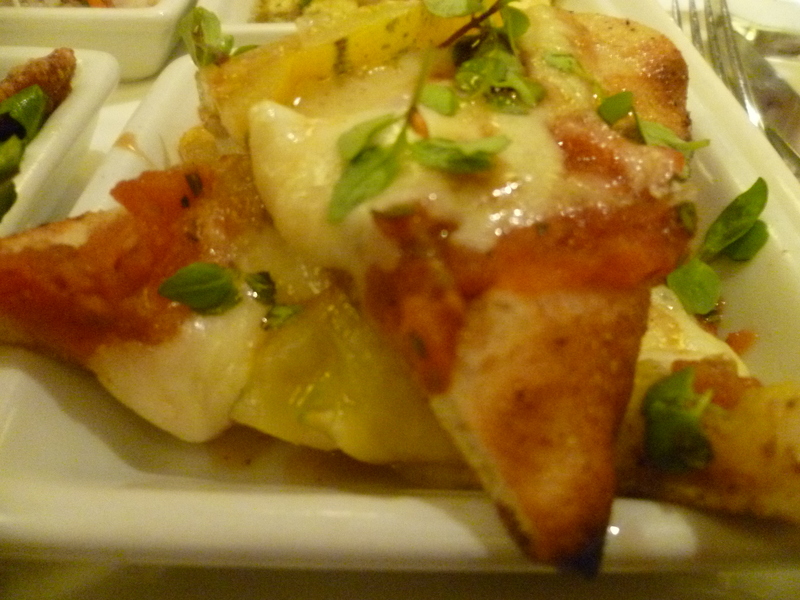 Very sad and repetitive and not very food blog friendly but I just can’t seem to stop. Anyway, The Orange Tree’s version was right up there with the best. 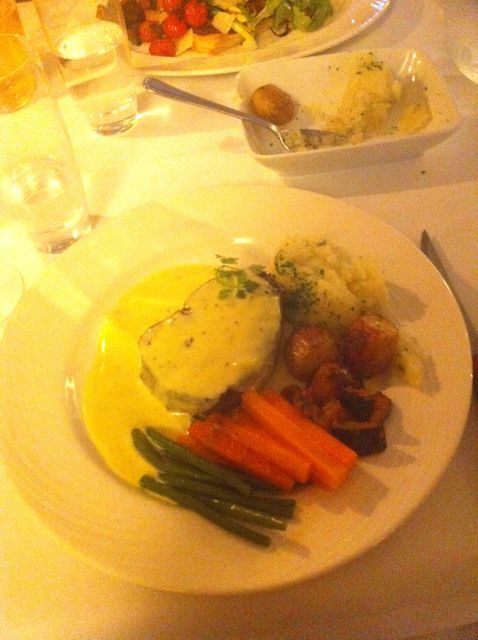 A thick, generous fillet with an impressive girth, perfectly cooked medium rare. I am aware that a good steak should not require a sauce but what food is not enhanced by a sauce comprised entirely of blue cheese and cream? 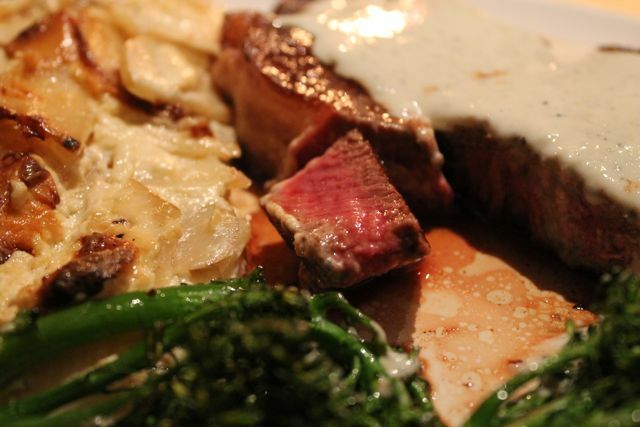 This blue cheese sauce was thick, creamy and most importantly, salty! You can see how perfectly the steak was cooked and even though I had to sacrifice all some of the vegetables in order to finish it, I did. What bravery! 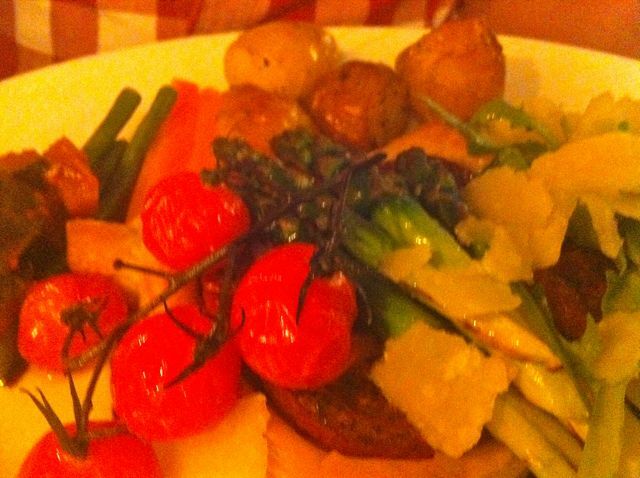 This was Ben’s vegetarian main course – Vine Tomato and Asparagus Tart – Puff Pastry Tart of roasted Vine Tomatoes and char-grilled Asparagus finished with Roquette, Parmesan Shavings and Rosemary Oil. I didn’t get to try the tart (and quite frankly I had enough food to contend with on my own plate) but he cleared his plate and I think I actually saw a hint of saliva fall from his mouth when I showed him the photo a couple of days later. 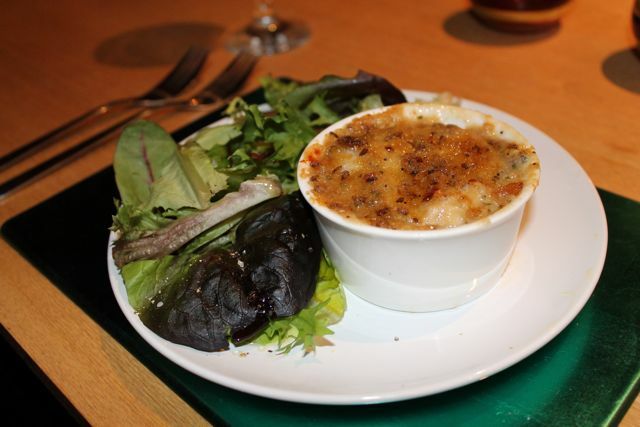 We were bought out accompaniments of garlic roasted new potatoes, spring onion mash and carrot and green bean batons to go with our chosen dishes which we found complimented them perfectly. 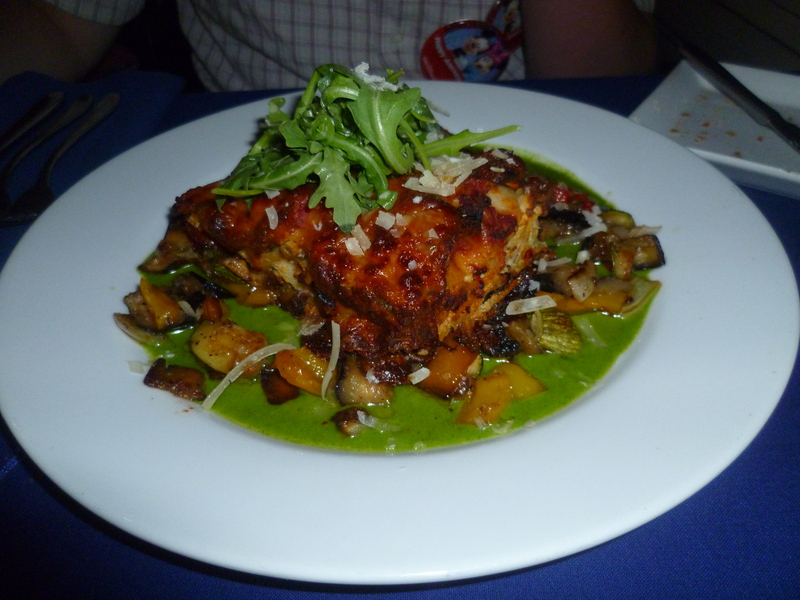 We felt the portion sizes overall were very generous, especially for the prices! Once we’d finished eating our lovely waitress came over and removed our plates and said she would give us a few moments for our food to settle before we looked at the dessert menu. We knew there was absolutely no way we could manage dessert though so we just sat back and enjoyed the last few minutes of our special dinner. When she came back with the menus we told her unfortunately we were stuffed and she looked very disappointed! Not as disappointed as we were, believe me. I’d seen photos of the desserts online and they looked incredible! 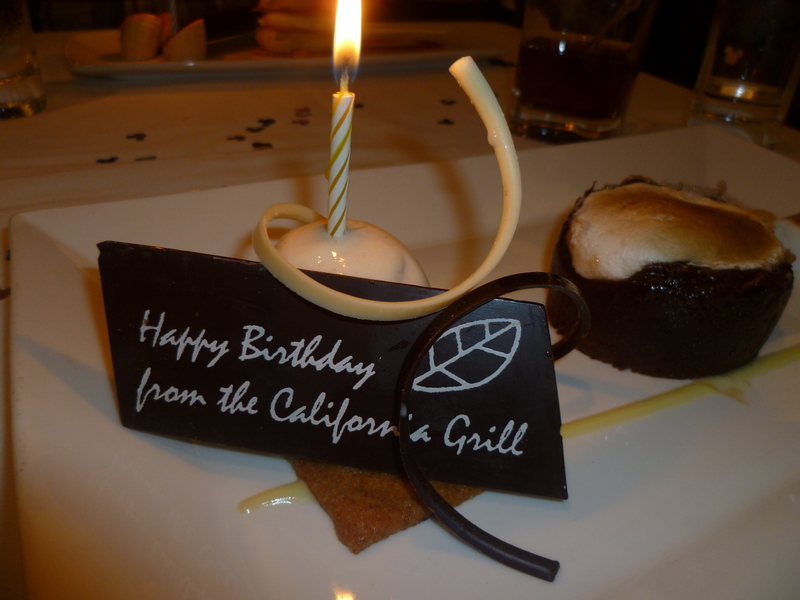 We were then getting ready to ask for the bill when our waitress bought us out a little surprise! How amazing is that!! 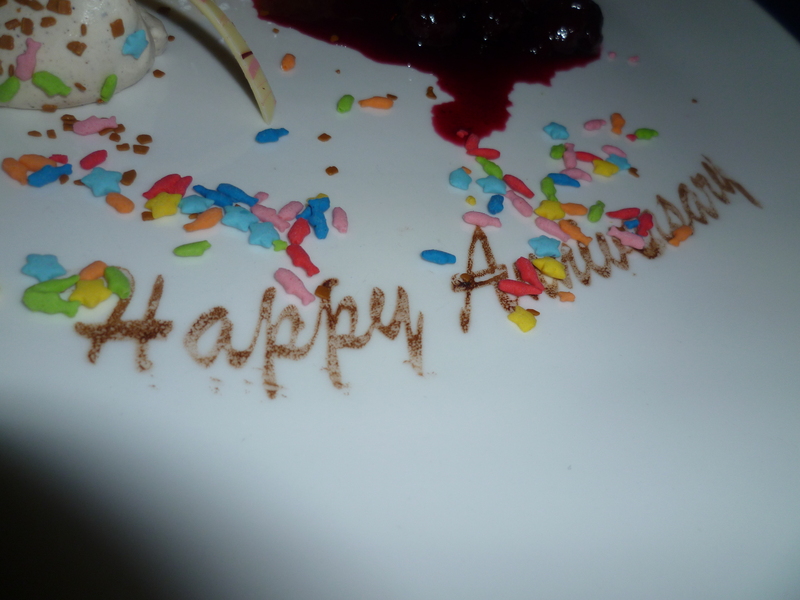 We were so surprised and so pleased, we thanked our waitress profusely and she thanked us for choosing to celebrate our anniversary with them! Obviously my special occasion dessert stomach came into action and we were able to force down the beautifully prepared bites of chocolate fudge and almond cake with minimal effort. What a lovely, thoughtful gesture. We were even more pleased when we received the bill! 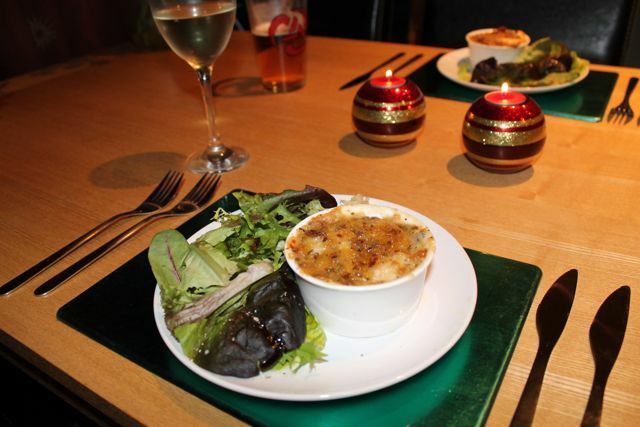 Our meal came to £57 which included drinks and 2 courses each which we thought was extremely reasonable for the quality of food, atmosphere and ambience in the restaurant and the great service we received. 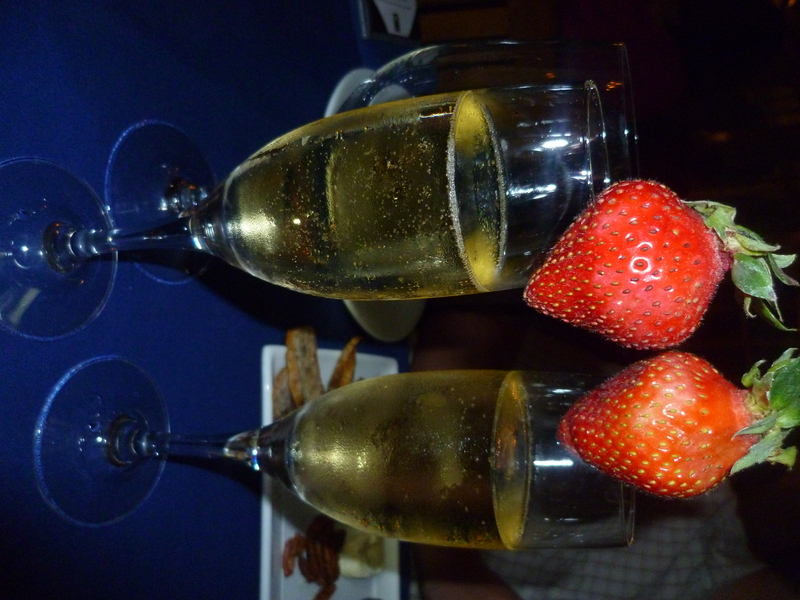 I would recommend The Orange Tree to anyone who is celebrating a special occasion or even just wanting a nice dinner out, there is a reason it is the number 1 restaurant in Torquay on TripAdvisor! 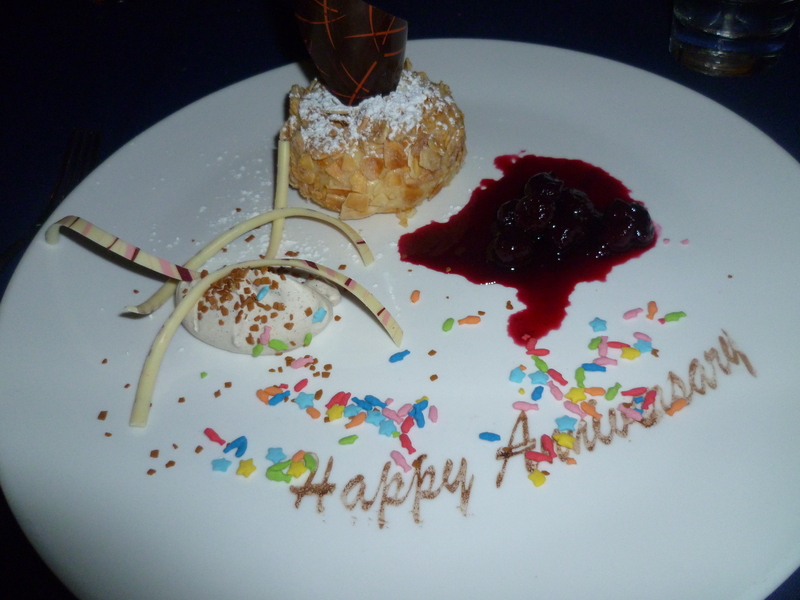 Thank you for making our anniversary celebration so special, we hope to come back and visit one day!